Anyone that works in an office environment knows that things can get a little dull some days. Being sat staring at the same four walls is inevitably going to get a little boring. So, we have the best gadgets for your desktop to brighten up those dull days! The Clockwatchers - Desktop Basketball is an excellent addition to the desktop at your office! This little gadget will create some much needed fun during your breaks, see if you can get some slam dunks! Or perhaps the Mini Executive Table Tennis would be more appropriate. Get loads of work mates involved on your lunch break, and have a little tournament! This mini set comes with a net, two bats and two balls so is perfect for a bit of de-stressing at lunch times! 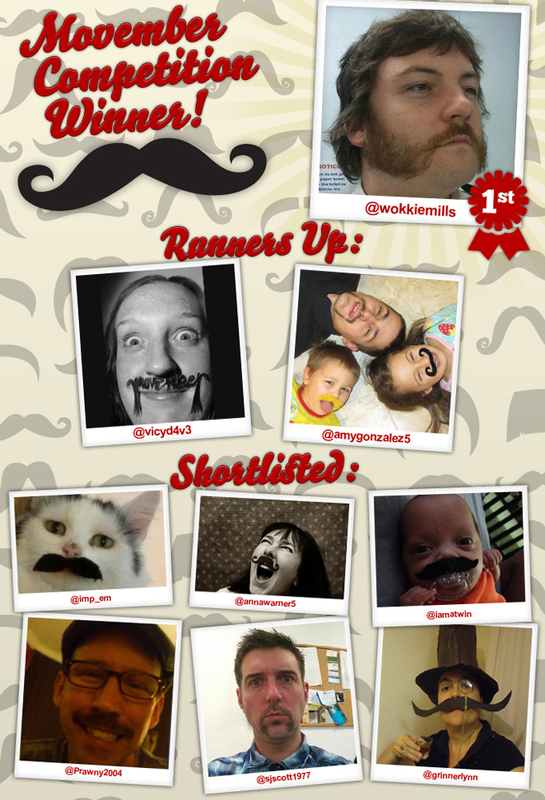 As November draws to a close, the time came for us to announce the winners of our Movember competition. Throughout November we've been encouraging you crazy lot to 'show us your mo' and 'tweet us your tasche' to win prizes and show your support for a great cause, and we've been inundated with awesome moustache pics from all over the country. It was so hard for us to choose the best three, and if we could we'd send you all a moustache-themed-prize! We started by shortlisting our mo-compers before choosing the final three, but we'd like to thank everyone for entering once again and you should all give yourselves a pat on the back for supporting such a worthy cause. The winner that stood out to us and will be winning the main moustache prize is the majestic @wokkiemills - that pose is unbelievable and inspiring - plus you've got one hell of a tasche going on there. Our two runners up who will also be receiving moustache prizes are @vicyd4v3 - your arts and crafts abilities would have Neil Buchanan quaking in his boots! And @amygonzalez5 - for making the whole office go awwwww at how adorable your family is! The other 6 we've shortlisted - you made cracking attempts and we just thought we'd add you to the picture to show our appreciation. So congratulations to our lucky winners, thanks to everyone who entered and keep your eyes peeled for more awesome Gadget Inspector competitions coming soon. In the meantime, may the mo be with you. Our Weekly Competition Is Back!! This week, we are celebrating the fact that the awesome film, Planes, is coming out on DVD on Monday the 2nd of December! We are going to be giving away one copy of the brand new DVD! So, if you fancy winning this awesome prize, follow us on twitter, and RT our competition tweet! This competition will close at midday on Monday 2nd December, so get following and RT!! Good luck! If you can't wait until the release of this amazing film, check out our RC Inflatable Dusty Plane! You can have hours of fun with this gadget, we did at the Gadget Inspector Headquarters! You may well already know, here at Gadget Inspector, we have recently brought into stock some amazing inflatable remote control devices! These being the Inflatable Remote Control Lightning McQueen - Pump and Play [no longer available], the Disney Plane Inflatable Remote Control Dusty - Pump and Play and the Remote Control Inflatable Despicable Me Minion Dave - Pump and Play. So, to celebrate the fact that we have these awesome inflatable remote control gadgets, we carried out a series of Gadget Inspector Races, the ultimate race to find out which inflatable is the fastest. In the first heat, we raced Lightning Mcqueen and Dusty Crophopper! Things got rather competitive and tense, but in the end Dusty Crophopper managed to get ahead of Lightning Mcqueen and won! In the next round we raced R2D2 against the Despicable Me Minion. The Remote Control Inflatable R2D2 Star Wars Pump and Play is another inflatable device that we have in stock, and has always been a very popular gadget! Who doesn't love Star Wars or R2D2? Anyway, back to the races, it was a tough race as the two competitiors are similar in size and height! However, the Despicable Me Minion did not disappoint, and powered through to take the title! Our final race was therefore between The Despicable Me Minion, and Dusty Crophopper! It was tough and everyone here at Gadget Inspector was on on tender hooks as we eagerly watched to see who would cross the finish line first! The Despicable Me Minion lost his nerve, and Dusty Crophopper took the lead and managed to win the Gadget Inspector races! The Inflatable Remote Control devices really do make great Christmas presents, for people of all ages! You can see how much fun they are to play with from the videos, everyone here at Gadget Inspector loved bringing out their compeititve sides! Send us your inflatbale races and let us know who wins, we would love to hear from you!